2005 Built PRIMATIST By Bruno Abbate, The G70. strong image but gentle water lines. For the interiors rare bamboos and natural leather have been used. The environment is every enthusiast's dream: elegant wide living spaces. 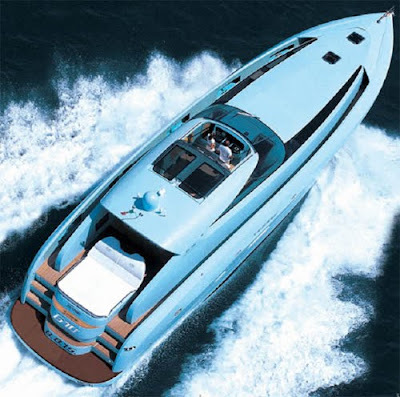 The four 875 hp Seatek engines allow the yacht to reach a top speed of 47 knots and a cruising speed of around 40. The G70 is one of the first four-engined yachts built for pleasure boating. This was an innovative choice aimed at reducing consumption (4 smaller engines use less fuel than two bigger ones), increasing safety and maneuverability, thus increasing gliding and sea-holding values. The G70 can also sail using only two or three out of the four engines with unimaginable performance. Altogether, this boat features so many other treats which are destined to capture the heart and the mind of dynamic shipowners with refined tastes.